Ngo Xuan Hien is in charge of communications and development for Project RENEW. Responsible for presenting and explaining Project RENEW’s mission and achievements to a wide audience, he provides the initial response to media and public inquiries about Project RENEW activities and acts as a primary point of contact for donors, government representatives, and visitors to Project RENEW. Hien’s other tasks include conceptualizing and designing presentations and development proposals for fund raising and other activities. 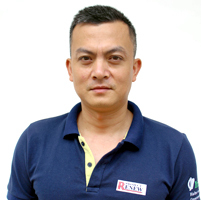 A teacher of English for two years in Khe Sanh and then a specialist at the provincial Department of Home Affairs for eight years, Hien joined RENEW in June 2008. He holds a B.A degree in English.